WASHINGTON (AP) — The Trump administration moved Thursday to vastly expand offshore drilling from the Atlantic to the Arctic oceans with a plan that would open up federal waters off California for the first time in more than three decades. The five-year plan would open 90 percent of the nation’s offshore reserves to development by private companies, Zinke said, with 47 leases proposed off the nation’s coastlines from 2019 to 2024. Nineteen sales would be off Alaska, 12 in the Gulf of Mexico, nine in the Atlantic and seven in the Pacific, including six off California. Industry groups praised the announcement, which would be the most expansive offshore drilling proposal in decades. The proposal follows Trump’s executive order in April encouraging more drilling rights in federal waters, part of the administration’s strategy to help the U.S. achieve “energy dominance” in the global market. “To kick off a national discussion, you need a national plan — something that has been lacking the past several years,” said Randall Luthi, president of the National Ocean Industries Association. President Barack Obama blocked Atlantic and Pacific drilling under a five-year plan finalized in 2016. A coalition of more than 60 environmental groups denounced the plan, saying it would impose “severe and unacceptable harm” to America’s oceans, coastal economies, public health and marine life. “These ocean waters are not President Trump’s personal playground. They belong to all Americans and the public wants them preserved and protected, not sold off to multinational oil companies,” read the coalition’s statement, which was signed by leaders of the Sierra Club, Natural Resources Defense Council, League of Conservation Voters and other environmental groups. 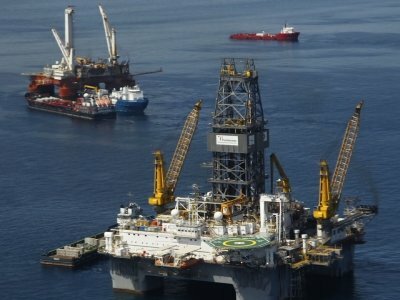 The proposal comes less than a week after the Trump administration proposed to rewrite or kill rules on offshore oil and gas drilling imposed after the 2010 rig explosion in the Gulf of Mexico. The accident on BP’s Deepwater Horizon rig killed 11 workers and triggered the biggest offshore oil spill in U.S. history. Zinke’s announcement “ignores widespread and bipartisan opposition to offshore drilling,” including from more than 150 municipalities nationwide and 1,200 local, state and federal officials, Hoskins said. “For more than 30 years, our shared coastline has been protected from further federal drilling and we’ll do whatever it takes to stop this reckless, short-sighted action,” they said.